Phew! Spring is starting out to be busy. We have both had extra busy weeks with work stuff and are trying to fit in home projects when we can in order to help us get ready for the season. Thankfully, the past two Sundays have been very productive. We spent all day one Sunday building 260 square feet of raised garden beds and filled them with compost over the the past weekend. We found a great deal on the lumber which was locally milled right down the street from our house. 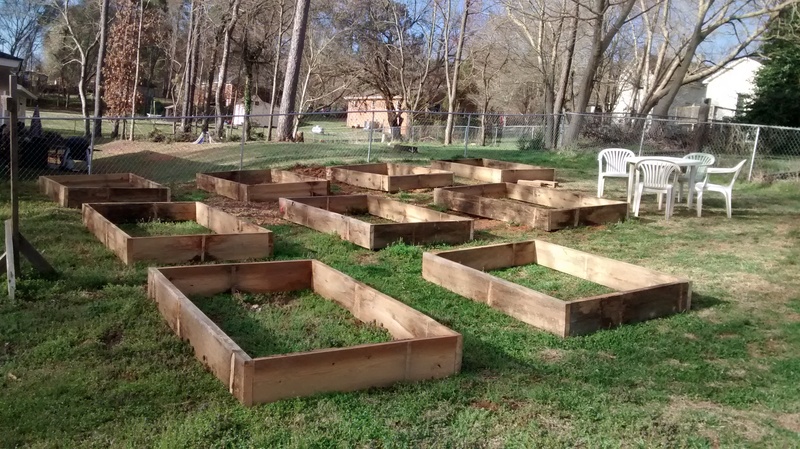 We made nine rectangular beds and they are beautiful. As of right now, we still have two to level and fill with compost. Last year, very soon after we moved to the homestead, we tilled a nice big plot of a garden bed and planted right in the ground. The harvest was phenomenal! It is amazing how much food you can grow right in your back yard. While this was successful, we did not keep the plot very tidy over winter, and decided to place the raised beds over the existing plot. They look great and I love the organization of the beds. We are planning to plant them square-foot garden style in order to maximize our yield, and we have just started planning them out. While paper and pen are great tools to track a garden plan, this year we are trying an online program, smartgardener.com. It looks very promising, providing a detailed plan, journal, and to-do list, but definitely takes a long while to set up with your seeds and desired plan. I at least got all of the seeds we have in our collection in our virtual garden plan and began thinking about how we will plant things; and perhaps, soon we can organize our seed collection. It has gotten a little haphazard. On Wednesday morning we had 18 cubic yards of local compost delivered which we filled the beds with, but there is still a ton of dirt. I am excited to use it around the yard though, and be able update all of our existing garden beds. For our veggies, so far, we have lots of lettuce and kale sprouted and our beets and peas have shot right up. We also started some of our Summer goodies like corn and tomatoes. We will do squash and a few others next week. Getting those seedlings in the ground will be so satisfying! Also, we adopted four hens who needed a good home. Michael picked them up yesterday afternoon and they seemed to have already adjusted pretty well. Their previous owners did not feel up to caring for them any longer, so we thought we’d take them under our wing. They may have another good year of egg laying, we will see, but we are already super happy to have them around.